Bollywood actress Aishwarya Rai turns 45 on November 1. To celebrate her big day, hubby whisked her and Aaradhya to Goa for a vacation. Aishwarya shared some of the pictures from her vacation in which Abhishek is seen holding on to Aish from the back and the picture will surely give you couple goals. 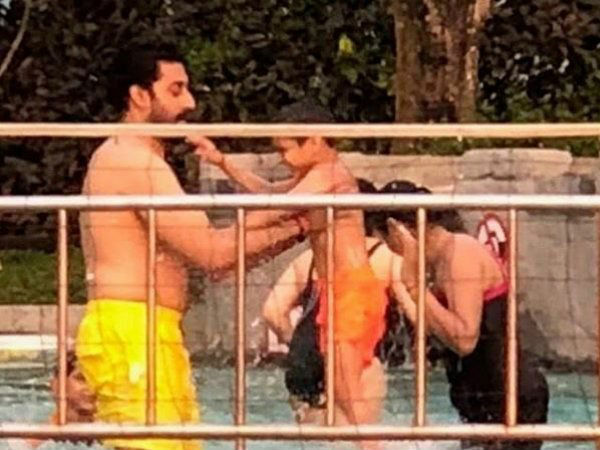 Well now, some more pictures of the couple is doing the rounds on social media, in which the duo are seen chilling in the pool. In the pic, Aishwarya dons a black monokini while Abhishek is in yellow swim shorts. The duo were accompanied by their daughter Aaradhya and some of their friends.